The TRIFOLD® Advantage series ramp, with its unique 3-fold design, offers the length required for wheelchairs and scooters to easily access steps, vehicles, raised landings. 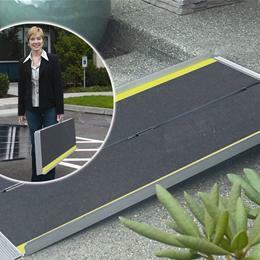 The ramp is designed to be used and carried as one unit, or if desired, can be separated into two individual sections. Folded Size: 60 3/4x 15"x11 1/2"